KX Takeover, KX 93.5’s annual fundraising week, ended on March 29 with nearly 50 guest DJs participating, working together to raise more than $60,000 for Laguna Beach’s nonprofit radio station. KX Takeover welcomes local leaders every year who guest host their own radio program, competing to raise the most money for KX 93.5. But the donations did not stop when the week ended; support continued to pour in through the weekend and into the following week. For the first time, KX staff had to extend the competition for the “Silver Tongue” award, which goes to the guest DJ or team that raises the most cash. This year, the top fundraisers and winners of the Silver Tongue award were Stu News Laguna’s Shaena Stabler and Laguna Beach Police Department Sgt Jim Cota, raising $4,285. The station is also awarding a second Silver Tongue to Cookie Lee, who raised the most money during the original week, totaling $3,780. This year, each host played their favorite playlist while coaxing the community to support the local radio station, imparting the importance of having an FM channel in Laguna Beach, especially in a time where most media is digitized and lacking human connection. Although the KX Takeover’s environment was lots of fun and friendly smiles, competition for the Silver Tongue award was fierce. KX 93.5 FM listeners heard from nearly 50 guest hosts, including local business owners, local residents, city officials, nearly every city council member, and even children who love their local radio station. Guest DJs designed their shows to be entertaining but also to share what having a radio station in Laguna Beach meant to them. Cookie Lee, a brand new resident to Laguna Beach and ukulele academy participant, heard about the KX fundraiser and immediately wanted to participate. As the community will soon find out, she is a bubbly personality that turned the KX mic into gold with her motown playlist and infectious smile that somehow translated through radio. Together with her long list of friends and supporters who wanted to help a good cause, she raised a ton of much needed funds for KX 93.5. Sergeant Jim Cota of the Laguna Beach Police Department who serves as the Public Information Officer (PIO) is often times the KX 93.5 FM correspondent for in-town crimes and police activity. He joined forces with Shaena Stabler, owner and editor of Stu News, and together they filled two hours of radio with juicy headliners that had the listening audience begging for their own radio show. Together, these three people share the coveted Silver Tongue Award for raising the most money for Laguna’s only radio station. KX 93.5 wants to thank every single KX Takeover guest host, participant, caller, pledger, donor, and restaurants The Cliff and GG’s Bistro for caring for and feeding the hungry DJs. KX 93.5 is here for its community and that week, KX Takeover, the community was surely there for KX 93.5. Welcome to the Happiness corner. Our personal narrative plays a role in how we approach situations in life, other people, and our own self-concept. Our story contains countless pieces of information, some random and insignificant, others full of meaning. Although we can never mute the facts of our past, the way we react to these facts and weave them into our personal narrative is something we can control. When we feel a need to make changes in our lives, we can rewrite or revise our story any time we like. It is an opportunity to reinvent ourselves, to start over, and to behave in new and different ways. Now is the time to think about rewriting your story by looking at your past and deciding what changes to make for the future. Often our stories are connected to events from our past. Positive chapters such as a happy childhood, a successful career trajectory, or a healthy relationship can impact our personal stories in an inspiring and uplifting way. These happy events can make us more kind, provide us a more positive outlook, and even improve our self-esteem. On the other hand, negative life events such as trauma, addiction, illness, divorce, etc. can impact our story in a negative way. These often leave us feeling isolated, depressed, and anxious. They affect how we deal with people and circumstances later in life. Challenging and painful chapters can make it harder for us to rewrite our story because we feel stuck in the past, powerless, or even unable to make a change. Timothy Wilson, Ph.D., a social psychologist at the University of Virginia, is an expert in what he calls “story editing,” which is a way to edit our stories by rewriting the path we are taking. “Our experience of the world is shaped by the stories we tell ourselves and our interpretations of it, and these stories can often become so distorted and destructive that they completely hinder our ability to live balanced, purposeful, happy lives. So the key to personal transformation is story transformation,” he says. The first step in rewriting your story is to assess who you are, how you have been feeling and behaving, and what circumstances have impacted your life. Ask yourself, “What is my story and what would I like to change about it?” Take time to truly figure out who you are, what is missing, what needs to be improved, and how you want to be in the future. An important part of this step is to realize that you can be resilient and rise above challenging times, and a challenging past, by taking steps toward positive change. The second step is to begin to work on the changes needed to rewrite your story. I have a client who I will call Lisa. She is an intelligent woman who balances working and raising a family. She is responsible, educated, and kind-hearted. However, due to a troubled childhood, Lisa has always been the type of person who gets very wrapped up in her own life. Only her husband and children are included in her circle. As a result of this, her co-workers and friends feel they cannot count on Lisa for guidance or support. Lisa is the “fun friend,” but not someone her pals can rely on. While she has enjoyed being known for a good laugh, this has always bothered her. After serious contemplation, she decided to rewrite her story and make a more concerted effort to be what she calls a “heart friend” along with being a fun friend. A “heart friend” checks in on friends when they are going through a tough time, makes offers to help in times of need, and listens to people’s stories of pain and struggle. It has taken some time, but Lisa has succeeded and is now not only an attentive friend, but she also feels more balanced in life and more able to reach out for support when she needs it. Finally, in rewriting your story, take time out on a regular basis to remind yourself that you can always take steps to change your behaviors, your path, and even your life. When we forget we have this power, we tend to feel stuck. When we remember that we have the power to change the trajectory of our narrative, we feel strong, hopeful, and happier overall. So if you are unhappy with the story you are living, now is a golden opportunity to rewrite your story and show the world, and most importantly yourself, who you really are. Happy 95th Birthday, Maria Siani! I would like to wish my wonderful and loving mother, Maria Siani, a very happy and healthy 95th birthday with many, many, many more healthy and happy years to come! My mother has led a very interesting life, both enjoying life’s happy events and enduring difficulties. Maria was born on April 15, 1924 in Gaeta, Italy, which is a seaport town similar to Laguna Beach. When she was just five years old, her family was forced to flee Italy. Her father refused to post a photo of Mussolini on the wall of their store and so they were going to kill him. Maria, with her mother and two brothers, left behind their family, friends, home, and business. They boarded a ship for the long journey to cross the Atlantic Ocean to arrive in America. Shortly thereafter, she lived through the Great Depression and World War II. Then, they moved to California where Maria was in nursing and met her loving husband, Salvatore Siani. They wed and had their daughter, Sandra. Maria is a cancer survivor. She was diagnosed with an aggressive cancer for which she had surgery, leaving her in a wheelchair, and was told that anatomically she would not be able to walk again. Through her persistence, love of her husband, and wanting to take care of her 18-month-old daughter, the strong and determined woman that she is defied medical science and walked again, even without a limp! She and her husband opened a beautiful retail store in Newport Beach, and their clientele included actors and movie studios. She was together with her loving husband for 49 years. Maria still is a very proud resident of Laguna Beach for 53 years and has fun enjoying all the events in (and out of) town! A women-empowered architectural forum, “Women and the Art of Architecture,” features 10 successful women architects from Orange County at an event on Thursday, May 9 from 6:30 to 9 p.m. at Neighborhood Congregational Church. The American Association of University Women – Laguna Beach (AAUW-LB), Laguna Friends of Architecture (LFA), and the American Institute of Architects Orange County (AIAOC) will host this free of charge event, which includes a slideshow of the architects’ work, a portable gallery “museum wall” celebrating past pioneering California women architects, and a moderated panel discussion. This event is designed for architecture lovers and supporters of women in the professions. The organizers also hope to attract high school and college students and their parents to this event. “It will be an opportunity to learn about architecture as a career and to be awed by the accomplishments of women professionals,” said Janice Hayden of both AAUW and LFA. Juintow Lin is one of the 10 successful women architects from Orange County who are part of “Women and the Art of Architecture.” Lin became interested in architecture when her house burned down while she was a freshman in high school. After her family engaged an architect for the rebuild, she was fascinated by the trade and decided to become an architect. Her passion led her to MIT, and later on a career path in New York, London, China and elsewhere. She is the founder and principal at Foxlin Architects in San Clemente designing contemporary, sustainable residences, and commercial structures. Women have made great progress in this historically male-dominated profession, today constituting more than half of all students enrolled in accredited architecture programs. “Being a woman in architecture used to be a rarity, but luckily with support and a network, we are not just surviving, we are thriving,” says Meghana Joshi from the Board of Directors of AIA OC. Collectively, these 10 women architects have worked in Orange County, Los Angeles, New York, London, Hong Kong and elsewhere. They have designed commercial buildings, health care facilities, community facilities, retail, multi-family housing, private residences, senior and affordable housing, and have done planning, design, and historical renovation. They have done research on Sustainable Urban Housing in China, invented an artificial intelligence-powered smart safety device, and have done large scale land planning. They include professors at Orange Coast College, Cal Poly Pomona, and USC. Several of these women followed a parent into architecture. Some are passing their career on to their own children. Betsey Olenick Dougherty established her own firm of Dougherty + Dougherty (now Perkins Eastman Dougherty). Then both her son and daughter became architects. “I believe that we should all be mentors to others in our lives, including architects, students, friends and family,” said Christine Lampert, founder and principal architect of Lampert Dias Architects, who practices what she preaches. She has served on several boards in Hong Kong as well as here in California. She teaches architecture at USC, having previously taught at Cal Poly Pomona, Orange Coast College, and SCAD Hong Kong. This is a free event, although donations will be accepted. Neighborhood Congregational Church is located at 340 St Ann’s Dr. When your dad is the CEO of the Surfrider Foundation, it’s pretty much a given that you and your twin brother are both going to end up trying out for the Laguna Beach Ocean Lifeguard Academy. 17-year-old Nelsen and his twin brother Sam are just two of the final Ocean Lifeguard Cadets competing in this year’s Laguna Beach Ocean Lifeguard Academy. Over 140 lifeguard hopefuls tried out this year, 40 cadets remain, and of those who graduate, only 30 may be hired as Laguna Beach summer lifeguards. “This is the 90th year of lifeguard training. 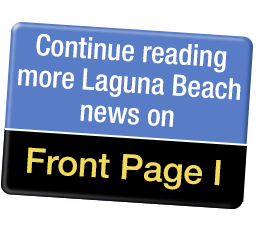 And there’s actually another 20 years of volunteer lifeguard training before that so we’re well over 100 years of lifeguard service here in Laguna Beach,” said Kevin Snow, Laguna Beach Chief of Marine Safety. Held annually around this time of year, the Ocean Lifeguard Academy is held on consecutive weekends. Cadet hopefuls are put to the test in three main categories: practical, which is a hands-on testing of materials learned, a written component where cadets take a written test, and then a physical portion where cadets compete against each other in physical events. Cadets underwent a strenuous portion of their physical training, rock training, on Sunday, April 7. After a warm-up run down the beach, cadets suited up and followed their instructors to the “Giggle Crack,” a rocky inlet near Diver’s Cove. There cadets were given a scenario in which they had to save a panicking drowning victim knocked into the crevice by high tides. Other aspects of the Ocean Lifeguard Academy’s physical training include swimming and running, and a combo of the two. Additionally, cadets learn how to perform ocean rescues, provide preventative contacts, administer medical aid, and are taught to enforce ecological regulations and City ordinances. A preventative contact occurs when a Marine Safety employee observes a beach patron engaging in an activity which could cause harm to themselves or others. The employee contacts the individual and educates them about the potential dangers, which can prevent the accident or emergency from happening. Preventative lifeguarding is part of Marine Safety’s proactive method for providing public safety along the City’s coastline. Graduating cadets who are hired will work as lifeguards for 10-12 weeks during summer, and an additional 2-3 weeks on either side of that timeframe depending on availability. Cadets who graduate the academy start at Main Beach for their first summer, and once they pass field training are eligible to move off of Main Beach and earn the opportunity to lifeguard in one of the further coves as their experience grows. Snow says it’s always best to know your limits at the beach: choose a location and type of surf condition to fit your current situation. His best tip? Talk to the lifeguard on your beach when you arrive to get a read on the conditions of the day. To serve as a lifeguard in one of Laguna’s iconic lifeguard towers is the dream of this year’s group of cadets. And for lifeguard hopefuls like Keeler Nelsen, it’s a dream that also comes with a sense of duty. Grapes for Grads, Laguna’s premier wine tasting event, to be held for the 14th time on Sunday, April 28, from 1 to 5 p.m., features not only wine tasting from over 80 wineries, but also live music from the well-known local band Yachty by Nature. Yachty by Nature is a tight 6-piece band that brings the finest in groovy soft rock from the late 70s and early 80s. Attendees at Grapes for Grads® will hear many of their favorite artists like Michael McDonald, Hall and Oates, Boz Scaggs, Steely Dan, Toto, Christopher Cross, the Eagles, among others. Grapes for Grads® is an annual wine tasting event and scholarship fundraiser hosted by Rotary Club of Laguna Beach. The event raises money for scholarships to assist students who attend Laguna College of Art + Design (LCAD) and graduates of Laguna Beach High School (LBHS) who are headed to college. The focus is on students who show excellence in academics or art and a strong commitment to community and who may otherwise lack the resources to achieve their educational goals. Guests will have the opportunity to taste wines from California and all around the world, including Argentina, France, Italy, New Zealand, and more, while enjoying music from Yachty by Nature in the beautiful Festival of Arts grounds. Delicious food from Wine Gallery, Oak, Maro Wood Grill, Harley Laguna Beach, and Moulin will also be served. There will also be live art demonstrations and exhibitions to enjoy by LCAD students at the event. This is going to be an unforgettable afternoon. Last year, the proceeds were estimated at $80,000 (gross) from the 13th Annual Grapes for Grads fundraiser hosted and staffed by Rotary members. “We knocked it out of the park,” said Jeffrey Redeker, chair of the 2018 event. Join in on the fun for a great cause. For more information or to buy tickets, go to www.grapesforgrads.com.